With Memorial Day on Monday, I’ll bet some of you already have started burning your way through that long-awaited first bag of charcoal or tank of propane gas. I know I have, much to my husband’s, kids’ and dog Harry’s delight, despite the rain, or maybe just in spite of it. But oh, how quickly the bloom falls off the rose. As much as my family loves grilled food, I know they will eventually tire of the standard backyard fare of chicken, burgers, steaks and the occasional hot dog or veggie kebab. Even if the meat’s the good kind, made from grass-fed cattle or free-range chicken, and the dogs come from premium cuts of 100-percent kosher beef. Even if I remember to soak everything in a really good marinade or brush on a tasty barbecue sauce. Even if the alternative is a bowl of cereal for dinner. I get tired of the tried-and-true, too. To keep everyone salivating at mealtime, I’ve decided to get (and keep) this summer-long barbecue party started by going international, which is easier than you might think. • Iran (“Food of Life” by Najmieh Batmanglij). Thankfully, we have a little more than 80 days to make this culinary trip around the world. Even if Pittsburgh’s weather doesn’t cooperate — hate to break it to you, but it’s supposed to continue to be colder and rainier than usual — the recipes below are sure to keep your grilling fun, festive and delicious. We found this “spicy” yellow chile sauce to be on the mild side, so if you like fiery foods, double the amount of chile. You’ll also want to season the chicken aggressively, as it’s pretty boring otherwise. Or so my kids informed me as they reached for the salt shaker. Prepare sauce by putting oil and garlic in a medium saute pan and set over medium-high heat. When garlic begins to sizzle, add onion, chile, turmeric and 1/2 teaspoon salt and saute until vegetables become limp and translucent, about 5 minutes. Transfer vegetables to a blender and add evaporated milk and walnuts. Puree until smooth. Add juice of 1 lime and taste for seasoning. Set aside. Slice the chicken against the grain into long strips, each about 1-inch thick. Drizzle with vegetable oil and season with salt and pepper. Remove skewers from water and thread chicken strips onto skewers. Starting 1 inch from bottom of each strip and treating the skewer like a needle, make “stitches” in the meat, weaving the skewer in and out every 2 inches or so. Heat grill to high and close the lid. Wait at least 15 minutes before lowering the heat to medium-high. Oil the grill grates with a vegetable-oil-soaked paper towel held with a long pair of tongs. Place skewers on grill, lower lid and cook for 7 minutes, or until bottom of the chicken develops grill marks and turns golden brown. Turn skewers over. Leaving the lid open, grill for another 7 minutes or until chicken is cooked through. Place grilled chicken skewers on a serving platter and garnish with lime wedges. 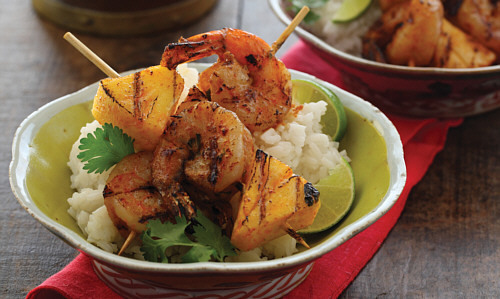 You can drizzle yellow chile sauce over skewers or allow your guests to do so themselves. 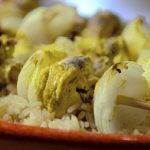 I had to watch several YouTube videos — in Farsi, no less — before I got up the nerve to try this popular Iranian dish. I found the skewers, sumac and ground lamb at Salem’s Market & Grill in the Strip, and the lavash bread at Trader Joe’s in East Liberty. I mistakenly used saffron threads instead of powder, but I’m pretty sure it didn’t affect the taste. Combine lamb, salt, pepper, saffron, turmeric, 2 tablespoons sumac powder, baking soda, onions and garlic. Knead with your hands for about 5 minutes. Cover the paste and let stand for at least 30 minutes and up to 24 hours in the refrigerator. Heat grill as high as possible; if you are using charcoal, do not spread it thin. Using damp hands, divide meat paste into equal lumps about the size of small oranges. 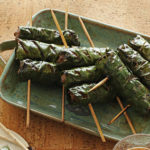 Shape each into a 5-inch long sausage and mold it firmly around a flat, sword-like skewer. Arrange on baking sheet, separated from each other. Cover and keep in a cool place. For the baste, melt the butter in a small saucepan and add the lime juice. Keep warm. Spread lavash bread on a serving platter. Arrange skewers 3 inches above coals or grates (bricks on either side make good platforms; the meat should not touch the grill). After a few seconds, turn meat gently to help it attach to the skewers and to prevent it from falling off. Grill the meat for 3 to 5 minutes turning frequently. Baste just before removing from fire. Avoid overcooking. The meat should be seared on the outside, juicy and tender on the inside. 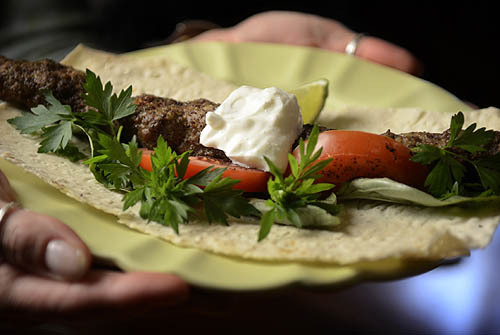 Place kebab skewers on the lavash bread platter. Keep on skewers until ready to serve and cover with lavash bread to keep warm. Loosen meat from each skewer and slide meat off using a piece of bread. Sprinkle with sumac powder and lime juice to taste. Serve with fresh herbs and yogurt and cucumber dip. Nush-e Jan! If like me you can’t find betel leaves, substitute grape or spinach leaves. Place 2 tablespoons oil in medium saucepan over medium-high heat. Add garlic, shallots, lemongrass and ginger and cook, stirring occasionally, about 3 minutes. Add jalapeno and ground beef, breaking up meat with a wooden spoon. Season with salt and pepper to taste. Add Chinese five-spice powder, palm sugar and fish sauce and cook, stirring occasionally, 5 to 7 minutes, or until meat is cooked through; remove from heat. Preheat grill or grill pan to medium-high and brush with oil. Lay betel leaves shiny side down and place 2 tablespoons of meat mixture in the center of each. Fold in the sides, covering meat, and roll closed. 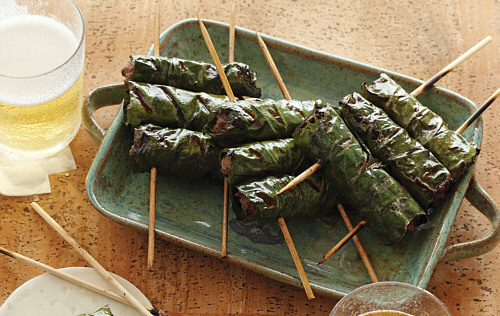 Run skewers widthwise through stuffed leaves, 3 per skewer. Brush each with remaining 2 tablespoons vegetable oil and season with salt and pepper. Grill about 5 minutes on each side, or until leaves just begin to char. Serve warm. These are on the spicy side, so you may want to add a bit more sour cream or yogurt to the marinade. Place ginger, garlic, salt, cumin, chili powder, turmeric and white pepper in a food processor. Finely chop, scraping down sides of the bowl with a rubber spatula. Add lemon juice and 1 tablespoon oil and puree. Add sour cream and yogurt, and pulse processor in short bursts, just to mix. Transfer marinade to a glass, ceramic or stainless steel mixing bowl. Wipe mushrooms clean with damp paper towels. Stir mushrooms into the marinade. Cover and refrigerate for 30 minutes. Thread mushrooms on bamboo or metal skewers. Cook on grill until tender and golden, 3 to 4 minutes per side, 6 to 8 minutes total, basting with remaining oil. Mix together soy sauce, mirin, sake and black pepper in a bowl; set aside. Divide beef into 4 equal portions. Arrange 1 portion into an approximately 6-inch-wide “sheet,” overlapping the slices. Place 3 scallions lengthwise along 1 side of the beef: 2 with the white parts in 1 direction, 1 with the white part in the other direction. Roll beef around the scallions. Secure roll with 3 evenly spaced toothpicks. Repeat with remaining portions of beef and scallions to make 4 rolls. Preheat grill to hot. Brush and oil grate well. Grill rolls for about 6 minutes total, turning every 20 to 30 seconds. If you have a flare-up, shift rolls to another part of the grate or use a spray bottle. After 3 minutes, brush on marinade. Keep grilling and turning rolls for 3 more minutes, brushing them with more marinade after every turn. When they’re done, the rolls will be browned, glossy and glazed. Transfer rolls to a cutting board and let rest for 1 minute. Remove toothpicks, cut each roll in 4 equal parts and serve. Place all marinade ingredients in a bowl and whisk together. Add shrimp and pineapple and toss gently. Cover with plastic wrap and refrigerate 30 minutes. Thread shrimp and pineapple cubes onto skewers, alternating items. Heat grill or grill pan to medium-high and brush with oil. 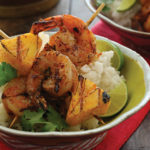 Grill skewers on each side 4 to 6 minutes, or until shrimp is just cooked through. Season lightly with salt and pepper and serve. A record 18,000 runners and walkers from 48 states and more than a dozen foreign countries will pound the pavement in Pittsburgh’s half and full marathons Sunday. And most will be loading up on carbs a few days before for the energy needed to power through the race. 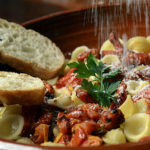 This pasta recipe couldn’t be easier, pairing orecchiette — which means “small ears” in Italian — with oven-roasted vine tomatoes. Toss with tiny meatballs to add protein. Good luck, and see you at the finish line! Preheat oven to 425 degrees. Arrange tomatoes in a single layer in an ovenproof dish, cut sides up. (I quartered the tomatoes to speed cooking, and left the seeds in.) Chop parsley and garlic clove together and sprinkle over the tomatoes with the oregano. Season with salt and pepper and drizzle with olive oil. Roast for 30 to 40 minutes, or until tomatoes are concentrated and beginning to caramelize. 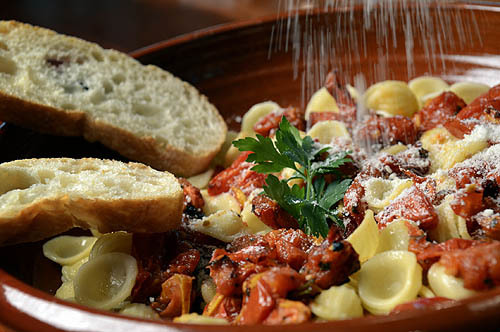 Cook the orecchiette in plenty of salted boiling water until al dente. Drain, tip into the dish of tomatoes and stir well. Sprinkle with pecorino, season with pepper and serve immediately on a warmed dish. Serves 3 to 4, depending on appetite.